I'm currently sat on a coach. Somewhere in Hertfordshire. It's just coming up to 7:30 and the sun is going down out of the window to my left. The radio is playing some tinny, unrecognisable pop track. My mate Steve is jolting himself awake from his slumbers every so often. Thankfully before his head lands on my right shoulder. I am slightly hoarse and when I do speak, the odd word comes out with a slight squeak. I have a glow on my cheeks from a few beers in the sun, but more importantly pride in my team. Pride that no bitter and twisted Wednesdayite is going to downgrade or diminish. 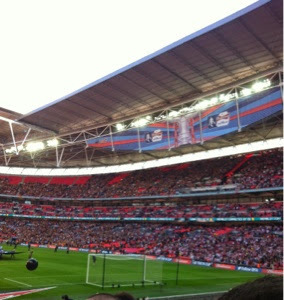 I believed that United would turn up today, when so often they have gone missing at Wembley. I believed that they would play with unity, pride and no shortage of passion. For forty five minutes they more than surpassed that. They outfought and outplayed a lifeless Hull side and scored their first goals in three visits to new Wembley. As Jose Baxter opened the scoring within the first twenty minutes I was in shock. I celebrated like I've never celebrated before but felt kind of shell shocked. When Stefan Scougall added the second, straight after Hull had equalised, I hugged my mates and felt tears welling up. I thought of my Nan, who passed away last August. I wished she had seen this. United outplaying a Premier League team, two divisions above us. They are performing at Wembley Nan. I pictured her sat in an armchair, holding her scarf, kicking every ball. I thought of my Dad, back home listening to the radio. This, one Wembley trip too many to contemplate. I wished that he was stood next to me. I knew it could all change. It did. But for forty five minutes I felt on top of the world. At half time I saw and hugged a Blade I know from twitter. We stood in queues, wide eyed in wonder. We deserved this. We had lost concentration once and been punished, but that aside we had performed way above any expectations. We will tire, got to keep it solid for ten or fifteen minutes, we said. We have a chance then. In the end, neither happened. Facing an onslaught after positive half time changes by Steve Bruce we found ourselves 4-2 down and seemingly down and out. Then in the final 90 seconds of normal time we scored. We had a chance and nothing to lose. Throwing caution to the wind in injury time time, Harry Maguire burst forward. His shot was blocked and Hull broke scoring a fifth goal. As one, the 32,000 Blades fans started applauding and cheering their team, with the Hull fans in raptures at the opposite end having sealed victory. It's something I've never seen or experienced before. Pride in the team. Pride in the club. Acknowledgment that we had lost, but by heck we had given it a go. And Hull knew it. Ultimately the result is tinged with disappointment. When you lead 2-1 and eventually lose there is bound to be that emotion. But the fans lifted their arms, stuck out their chests and applauded the crestfallen players in red and white shirts. Much has changed at Sheffield United in the last 7 months, most - if not all - of it for the better. We are a couple of players, a striker in particular, away from a successful side. The cup run, allied with the upturn in league form, makes the retention and recruitment of players an easier task. Off the pitch the club is operating more efficiently and creatively, with communication much improved and a genuine unification of fans, players, staff and board members. People left Wembley tonight in a positive mood. A seemingly hard concept for some fans of other clubs to consider. We had conceded five they said, what is there to be happy about? How little they know. As the sun disappears beyond the horizon and the day is ending, it is clear that United are moving in a positive direction. And today is only the beginning. Recent big games involving United were well at the forefront of my mind ahead of the Cup semi-final; that last minute goal against Palace I remember watching as an 8-year old, not really sure why we weren't celebrating; Shearer's goal I listened to on the radio with my dejected dad; the abject performance against Wolves; the bitter feeling of being robbed by some dodgy refereeing and THAT save from Seaman that same season; and the feeling of inevitability against both Burnley and Huddersfield. All of those memories, coupled with our current league situation saw me expecting defeat, hoping that we didnt embarrass ourselves, that we would finally turn up on the big day. There was, however, a very small voice in the back of my mind telling me to believe. The win's at Villa Park and Craven Cottage showed me what this side can do, the incredible turnaround under Cloughie. And how they showed it! Those first 45 minutes you wouldn't have guessed there were 2 divisions between the sides. The energy, the organisation, the creativity and imagination, the attacking intent. Was this really United, my United, outplaying a Premier League side, on the big stage? Because of work I couldn't be at Wembley, I watched the game in a bar in Cyprus, a lone Blade surrounded by celebrating Liverpool fans. The pride I felt at half time was like nothing I have ever experienced, many of those Scousers briefly converted, amazed at the football played by a League 1 side. In the end it wasn't to be, Steve Bruce proving his tactical nous, brave enough to completely change Hull's approach. For 15 minutes in the second half it looked like we would be over-run, embarrassed maybe. Their class showed, Tom Huddlestone bossed the midfield, the pace of Aluko and Fryatt scaring our defenders. We hung on in there, kept the game alive. For a fleeting moment in the final minute it looked like we would find a way back into the game, but, as we know, when you go all out for a goal you always run the risk of a counter attack. I awoke this morning with a strange feeling. One of complete and utter pride. We finally turned up to the big occasion. The pain of defeat isn't as profound when you know the players, for a man, gave 100 percent for the full 90 minutes. I completely agree that it finally appears that we are moving in the right direction and with Nigel Clough at the helm, who knows where that might take us. Great piece mate.....Sums my own feelings up to a tee! UTB! Great piece mate, well written and heartfelt. Gutted you guys lost after playing so well and believing so much. The turnaround at United is nothing short of admirable and I hope we see you back in the championship again with us soon. I'm thinking it won't be long.